ANSWER: Nobody can manipulate the currency market forcing it to change trend. Trump will fail because he cannot manipulate the dollar down when the FX market’s $5.3 trillion per day in trading volume dwarfs the equities and futures markets. Yes, the Treasury has less than $150 billion in its Exchange Stabilization Fund to try to manipulate the currency. Good luck. That amounts to a drop of rain in the ocean. Trump is wrong about China manipulating its currency. You see China going after Bitcoin trying desperately to prevent capital flight. There is nothing Trump can do to prevent the rise in the dollar when you have Europe on life-support as is the case in Japan, and China keeps trying to stop its citizens from putting money offshore. Nevertheless, it is the short-term news that is giving a bounce to the euro – not government intervention. Even combining all the governments together cannot reverse the global capital flows. If the economics of Europe are in crisis and election after election seeks to exit the EU, there is far more at stake than just politics. We are looking at a crisis in European banking as their reserves are made of of Euro members. The ECB hold 40% of member states bonds. A breakup of the Eurozone holds far more chaos than anything you have read about Europe – AND THAT IS AN UNDERSTATEMENT. Then we have the Sovereign Debt Crisis that will hit Europe, Japan, China, and the United States. There is no escape. We are preparing an institutional risk report on this subject of European banking, and it is massively under-reported and not even comprehended. Trump will fail because he and his team lack the scope of international understanding and cannot manipulate the dollar lower to help bailout his trade proposals. If we look only at trade, the share of manufacture in world merchandise trade fluctuated in the range of 55-60% between 1973 and 1985, then increased sharply, reaching 75% by 1995. 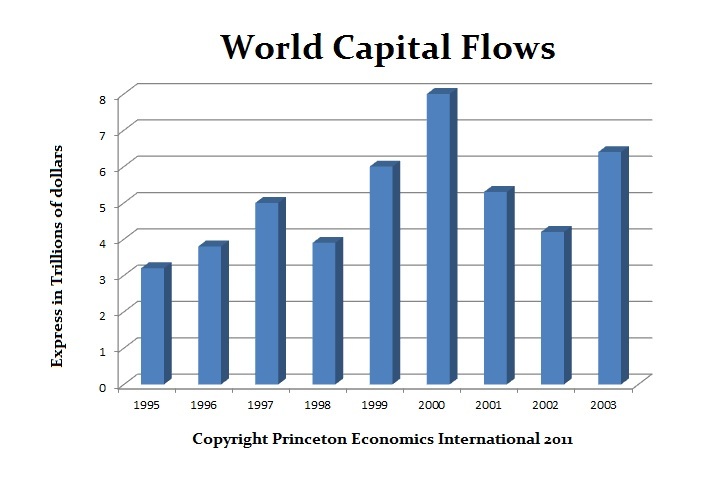 But trade is not the majority of capital flows. One might expect total recorded world trade, exports plus imports, over all countries to equal financial flows payments plus receipts. But in fact, during 1996–2001, the former was $17.3 trillion, more than three times the latter, at $5.0 trillion. The problem is our accounting system for trade. To reduce the trade surplus Japan had with the USA during the 1990s, I instructed our clients to buy gold on the COMEX and take delivery. The gold was thus exported and resold again into London. The trade surplus Japan held over the USA was reduced for there is no distinction between a manufactured product and raw commodities. It is always measure in dollar flows in and out. Likewise, most financial capital flows are not recorded at all. Financial transactions between international financial institutions are cleared by netting daily offsetting transactions. Hence, U.S. banks have claims on Japanese banks for $10 billion and Japanese banks have claims on U.S. banks for $12 billion. Therefore, the net flow recorded in the transactions will be cleared through their central banks with only $2 billion from the United States to Japan. Then if the purchase of the goods in the USA by Japan are financed, the goods may travel but no money moves between the countries when financed by a USA bank. Since the collapse of Bretton Woods, the introduction of the floating exchange rate system has rendered the global capital flows total gibberish from a formal accounting standard since the value of the dollar rises and falls making comparisons impossible using a system that was designed with a fixed exchange rate structure in mind. Since the 1970s, this floating exchange rate has resulted in a sustained and unexplained balance-of-payments discrepancies in both trade and financial flows. The unrecorded capital flows in netting out positions distorts the real picture. We have to obtain raw data to overcome these problems and then run it through the filter of floating exchange rates to come up with any hope of understanding capital flows in our models. Those who have tried to mimic our capital flow analysis lack the raw data and they are using the standard flows, which are seriously wrong.